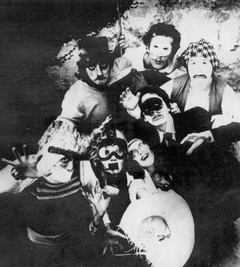 During the dark years of the last dictatorship in Argentina, at the end of 1979, in the city of Rosario,an experimental art group called Cucaño, made of very young adults, emerged. They felt the need to express their discontent against the dangerous and deadly environment while at the same time they were searching for their own identity in their adolescence. They created a notable collective work,fleeting but substantial, which was the most thorough response that a young person could give or give to themselves in those times of extreme repression against self expressions.